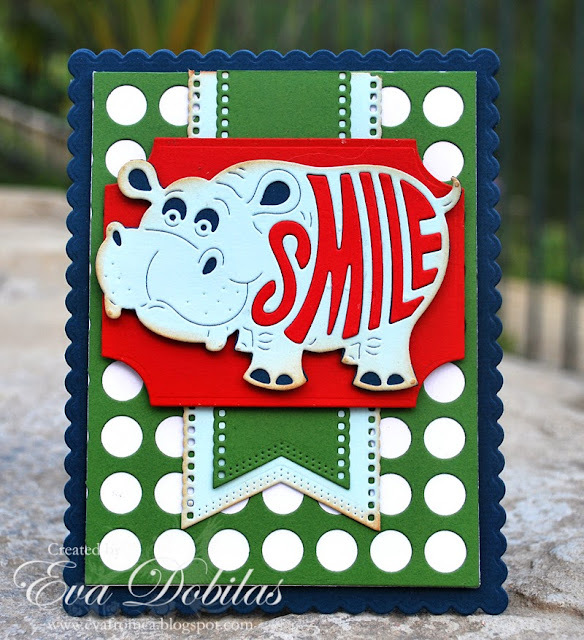 Hi there, I have a cute boy card once again inspired by this week's Cheery Lynn Designs challenge. Feminine cards come easy to me, so I thought I would challenge myself, especially since I had this cute happy hippo I haven't played with yet from this release and I just knew he would make a cute boy card. So I die cut my card base using A2 Frames Rectangular Scalloped out of a dark blue card stock, than I die cut a one size smaller A2 Frames Rectangular Classic out of white card stock and one Lattice Circle Frame out of green which I cut down to match the size of the A2 Frames Rectangular Classic. I adhered that on top of the white panel and than adhered that to my card base. I die cut two different size Pierced Banners, one out of light blue and one out of the green card stock and layered them on top of my card. I die cut my little hippo out of a light blue color and adhered it to a dark blue card stock so the dark blue would show through, and I cut off the access dark blue. Than I die cut a red hippo as well and took the SMILE word out and added it to my light blue hippo. Finally I die cut a Coved Rectangle out of red card stock and popped my hippo on top of it to stand out more and once again using popped dots added that whole element to my card front. 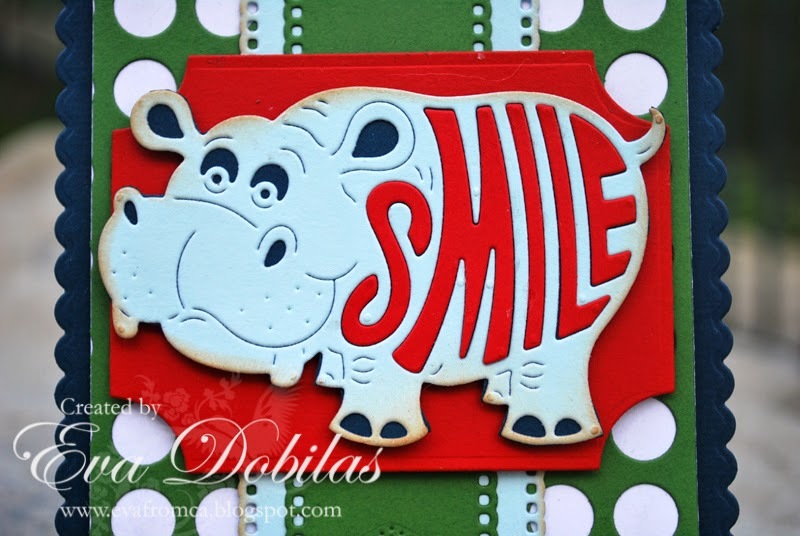 Well, sure hope this little card puts a smile on your face!